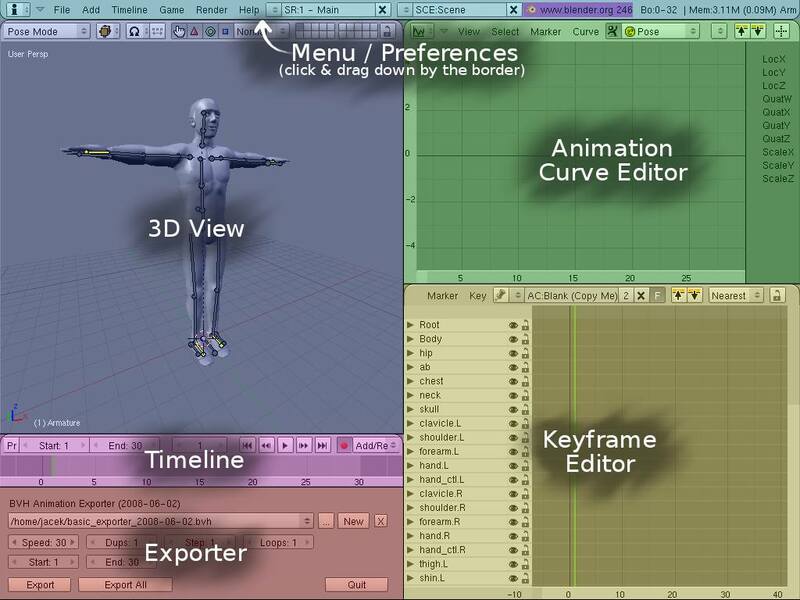 Before we get to the learnin’, let’s get you set up with Blender and the exporter. Once you’ve got Blender downloaded and installed, start it up, then use File > Open and find the exporter scene, wherever you downloaded it to. 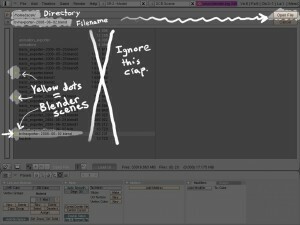 Blender’s file dialog is a bit weird and intimidating, but you’ll get used to it. Directories are always at the top, and shown in white. Files are below that, in gray. 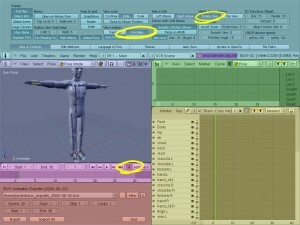 Blender scenes are highlighted with a little yellow box next to them. Note: If you’re not a Unix geek, you might be confused about the “.” and “..” — those mean “reload the current directory” and “go up one directory level”, respectively. Menu / Preferences: Menus for opening and saving the scene, etc.. You can also pull it down to reveal the preferences, which I’ll cover below. 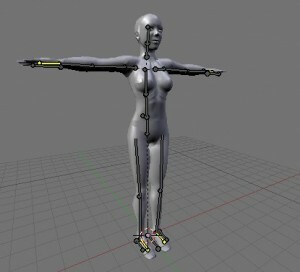 3D View: Shows the 3D scene with our armature and avatar. You can move the camera to view from different angles, and adjust the armature to different poses. Exporter: A script I wrote to export the animation as a Second Life-compatible BVH file. Put your mouse in that panel and press Alt+P to start the script and see the interface. Animation Curve Editor: Shows the animation curves, a graph representing the change in bone rotation, position, etc. This panel is known in the Blender community as the “Ipo Curve Editor“. As a beginner, you’re mostly going to be working in the 3D view for posing, the Timeline for changing which frame of the animation you’re working on, and the Exporter for saving as a BVH. We’ll briefly touch on the Keyframe Editor for copying the pose from one frame to another. The Animation Curve Editor only gets a brief mention in this tutorial, because it’s complicated and not necessary for basic animations. Okay, we’re almost ready to start. But first, there are some options that I recommend for new users, to avoid confusion and frustration. 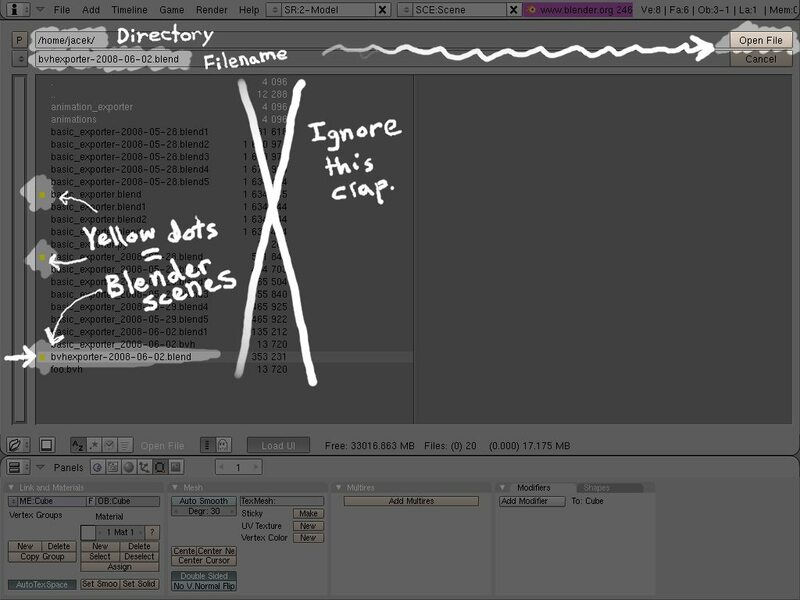 Because the creators of Blender are tricky devils, they decided to hide these options someplace that you would never look: off-screen. To get at them, you have to put your mouse over the bottom border of the menu at the top (so that it becomes an up/down double arrow), click, and drag it down. Surprise! This is actually a hidden panel, where the preferences are. Middle Mouse: Rotate View. This lets you click and hold the middle mouse button and move the mouse to rotate the view. Otherwise you’d have to hold shift while doing that to get the same effect. View Rotation: Turntable. This prevents your camera from tilting sideways, which is a common frustration if you’re not used to Trackball mode. Auto-Keyframe. This is the red dot at the top of the Timeline panel. 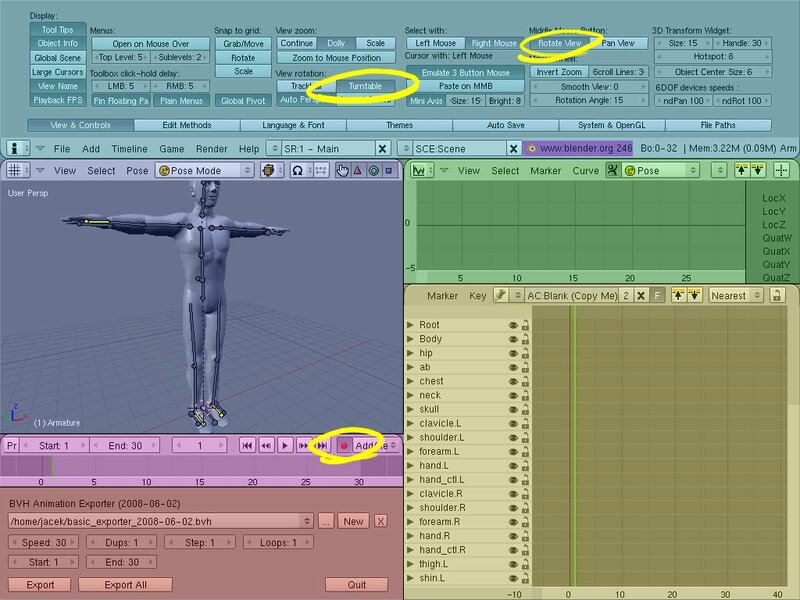 With this turned on, Blender will automatically insert keyframes as you pose the skeleton. Otherwise, you have to press I with the bones selected and insert a keyframe manually — and if you change frames, your pose changes would be lost! You can turn Auto-Key off later as you become more experienced and want more control over when a keyframe is set. Once you have those set, drag the menu/preferences panel back up into its original position so it’s out of your way while you work. Then, use the File > Save Default Settings menu option to load those options up when you start Blender. Note: it will also make Blender start with the animation exporter scene loaded when you first open it up! This is a bonus for people who only use Blender for this purpose, but you might want to skip saving the defaults if you use Blender for other things too. The exporter scene contains both male and female versions of the avatar. Press 1 for the male version, or 2 for the female version. Both of them are controlled by the same armature, and it doesn’t make any difference in the exported animation. It’s just to help you visualize how the animation will look. Alrighty, you’re all set up! Next, we’ll cover moving the camera around.